Welcome To Beter Minecraft Mod! Add More Things In To Minecraft! This Mod Is Still In Beta So Maybe There is Bugs! The word "beter" is spelt wrong. its "better". we can tell youre 5. @#1 oh and "Dungens". dude its dungeons. 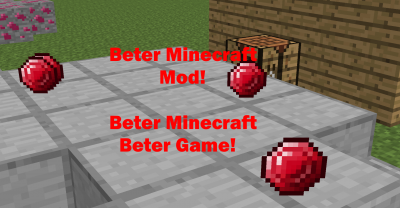 Opps I Spelled Beter Instead of Better! Also New Bug Fix Update is Out! And New Update is Coming Tomorrow! Sorry For Not Updating This Mod!